Thanks to all the talented cosplayers who entered our Cosplay Contest! We had an extremely tough time picking favorites out of so many incredible entries. But one entry caught everyone's eye here at SWSCA, demonstrating a wide range of high-level fabrication, mechanical, electronic and painting skills... and all on a DIY budget! 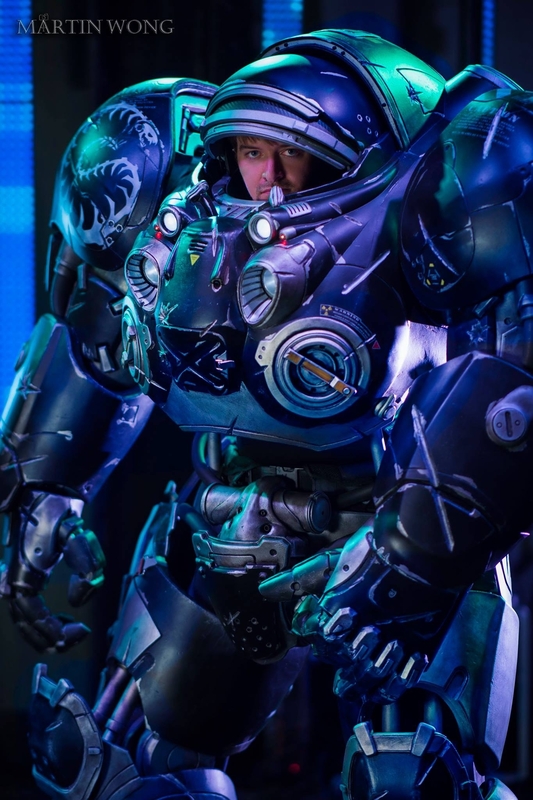 Congratulations to Michael Wiggins on his "Jim Raynor - Starcraft 2 CMC Armor" build. Your forms and paint work are beautifully realized, you've nailed the illusion of mechanical functionality using decidedly non-mechanical elements (EVA foam and PVC), and you've packed your suit full of surprises that take it into feature film-quality territory, including LED lighting, fully articulated 3-D printed animatronic fingers, and topped off by a functioning dual layer helmet visor!! Truly epic stuff, Michael. Such an amazing work of art! I feel no shame in losing to this! Hearty congratulations. I've really enjoyed witnessing this competition so much. Outstanding work! Congratulations on winning. Enjoy the one full year of courses. I know I sure did.